Please take advantage of these free extras for Mocha users. For more scripts and tools, check out: mochaImport+ for both After Effects and NUKE. Shape to Layers By www.crgreen.com, this script allows you to unpack masks from a layer and stack them on new layers. Redefinery Scripts By www.redefinery.com, this script pack includes Masks to Shapes, Shapes to Masks, parallax nulls, average tracks, and a lot of other useful scripts. 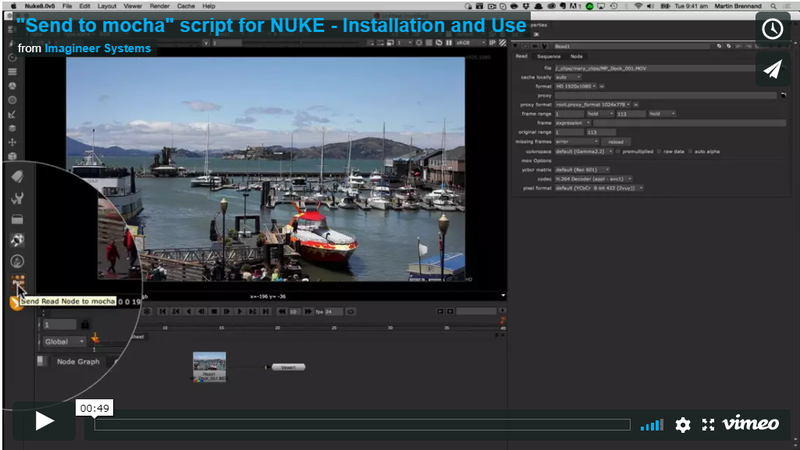 Send to Mocha This python script allows you to “send footage” from NUKE to mocha Pro 4.x with the click of a button. Download the Send to Mocha file. Please read the README.txt in the zip file for installation instructions and the path to copy to your Nuke init.py script. The script should then load mocha with the footage. While this should work on your machine, we can’t guarantee that it will work with everyone’s version of python. Please contact support if you have any questions.